The answer to this question may sink your career, your team and your project. If you respond with a “yes,” you may be forced to take on additional work. If you say “no,” you may be branded as someone who can’t get things done. Establishing an upfront, common understanding of “done” can save teams and businesses countless hours of refactoring, process-thrash, unclear communication, and hidden work. The list I presented to our stakeholders in the meeting is shown in Figure 1. Our stakeholders were shocked. They remarked that they had never seen such detail and commitment to a quality release before. 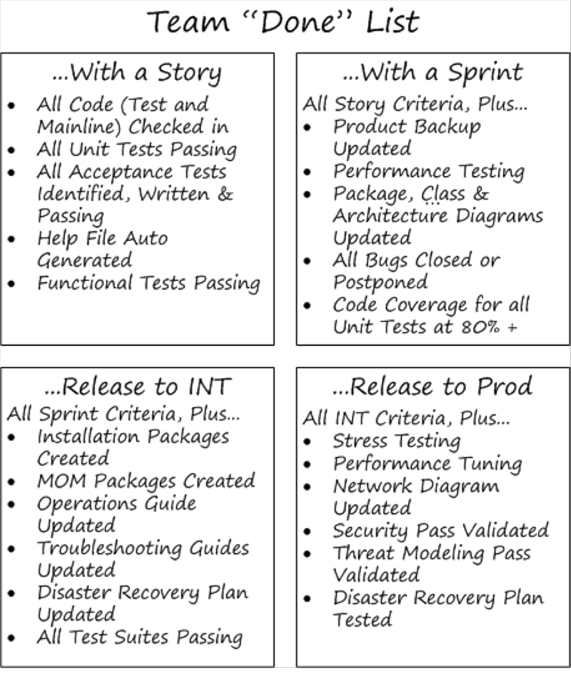 After seeing the list, the systems engineers were comfortable with the level of work we were doing to address their needs on each story, sprint and release. The security team was equally pleased to see the level of architecture, documentation and threat modeling that the team was doing. For exact matches, simply take the two matching sticky notes and stick them to each other so that the top one fully covers the one underneath. Do this only when it is clear that the items are exact matches and that the decision to marry them will require little discussion later in the session. Osborn 01 Osborn, Alex F. 1948. Your Creative Power. New York: C. Scribner’s Sons.